I have been making these cookies for seven years now; seven years! They are quick, easy and delicious. It is my everyday chocolate chip cookie of choice. 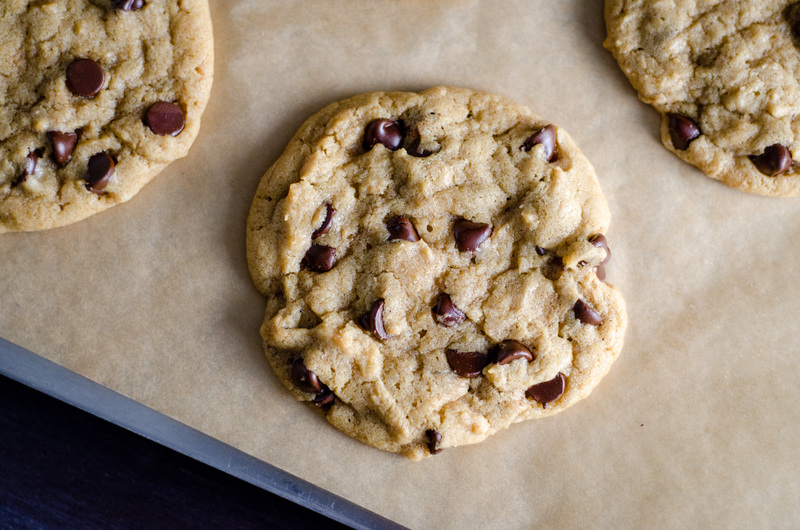 When a cookie craving hits, we can be enjoying these within 30 minutes, warm out of the oven. These cookies call for melted butter cooled to just warm, which makes them so quick – no waiting for butter to warm or soften to the right temperature. The melted butter also helps to make these chewy. According to Cooks Illustrated, by melting the butter it separates the water and fat molecules, which lets the water immediately attach to the proteins in the flour and start to form strands of gluten. The gluten that forms makes the cookies chewy. I make plain chocolate chip cookies all the time, but this is a great base for creative variations too; at the bottom of the recipe, I’ve listed some of our favorite mix-ins. Adjust oven racks to upper and lower-middle positions; heat oven to 325 degrees. Prepare two large baking sheets by lining with parchment paper or spraying with non-stick spray. Combine flour, baking soda and salt in small bowl with whisk; set aside. By hand, or with an electric mixer, mix butter and sugars together until well combined. I’ve used both mixing methods over the years, and both work equally well. Beat in the egg, egg yolk, and vanilla until incorporated. Add dry ingredients and beat at low speed until combined (by hand will work too – just takes a little more effort). Stir in the chocolate chips to taste. Roll a scant of a quarter cup of dough into a ball. Hold the dough ball at opposite ends, and then pull apart into two equal halves. Rotate halves upwards 90-degrees so the craggy tops are facing upright. Join halves together at base to form back into a single ball, being very careful to not smooth the jagged surface just created. This is the only tricky part in the recipe; see the photo below for a visual. Place dough balls onto baking sheets, jagged sides face up, and 2 1/2 inches apart. 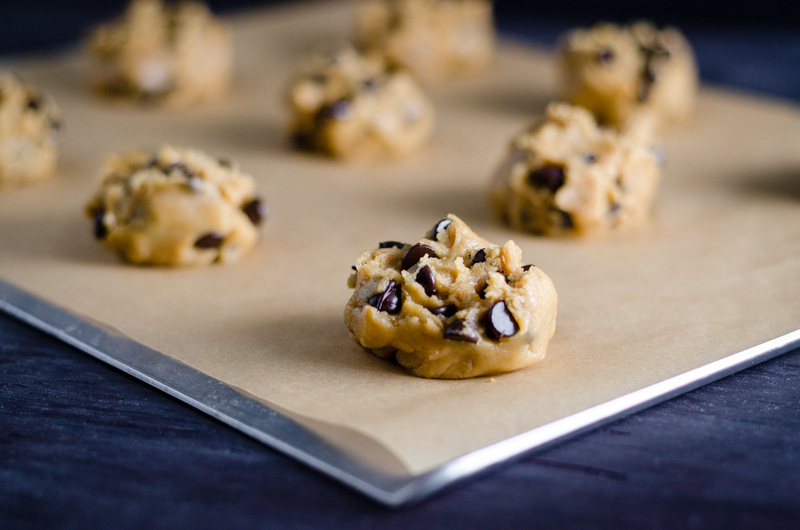 Bake until the cookies are light golden brown, and the edges start to harden; about 15 to 18 minutes, rotating the sheets top to bottom, and front to back half way through. The centers of the cookies should still be soft and puffy. Cool cookies completely on baking sheets. Remove cookies from sheets with a flat, metal spatula. Store in an air-tight container. Chocolate Chip Cookies with Toffee Bits – substitute 1/2 cup of broken up toffee bits for 1/2 cup of chocolate chips. Chocolate Chip Cookies with Candy Pieces – substitute 1/2 cup of chocolate candy-coated pieces for 1/2 cup of chocolate chips; decorate tops of cookies with additional candy-coated pieces if desired. Chocolate Chip Cookies with Coconut and Toasted Almonds – add in 1 cup of sweetened flaked coconut and 1 cup of toasted silvered almonds. 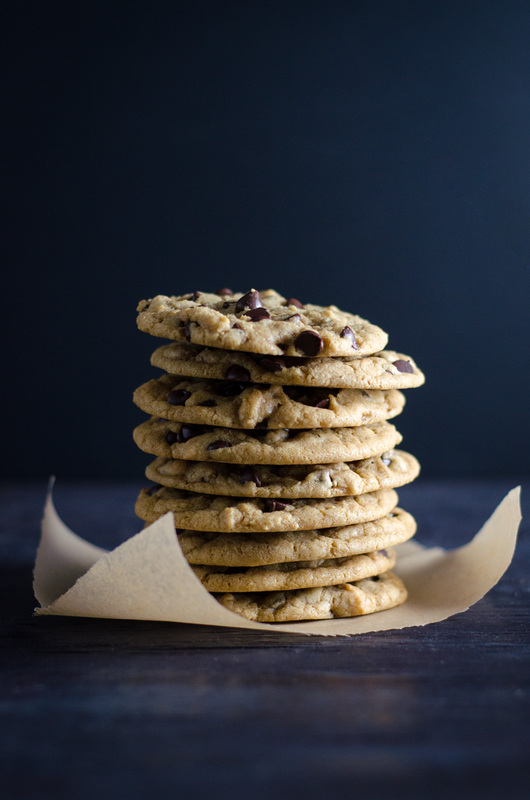 Black and White Chocolate Chip Cookies with Macadamia Nuts – substitute 1/2 cup of white chocolate chips for chocolate chips, and 3/4 cup of slightly chopped macadamia nuts. Chocolate Chip “Chunky” Cookies – Add one cup of chocolate chips, 3/4 cup of raisins and 1/2 cup of rough chopped dry roasted peanuts. These look delicious! I’m going to have to have a try and report back. 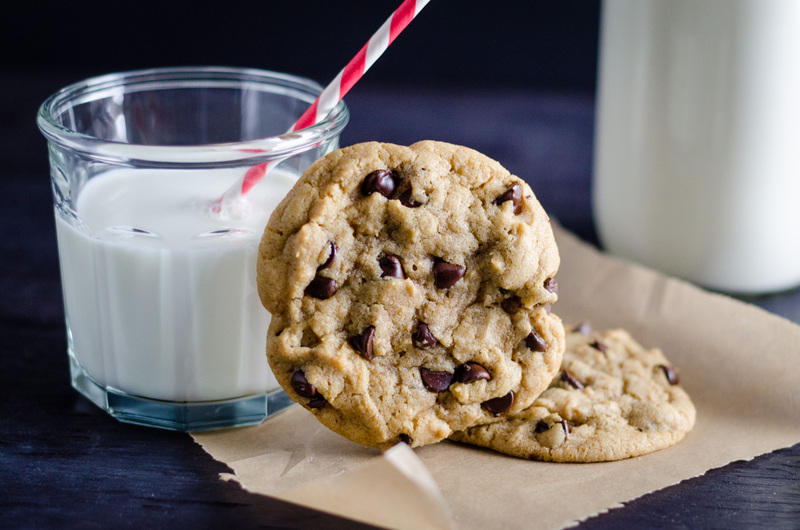 These look so good I’ve decided to try them…this is a huge thing for me because I’ve been using the same chocolate chip cookie recipe since I was in home economics in high school. I’m 45 now! I just mixed them up and I’ll report back once they’re baked and eaten! Thank you! These are REALLY good cookies…my one wish is that they were a bit more “salty” so I’ll up that to a full teaspoon next time but we love the texture. 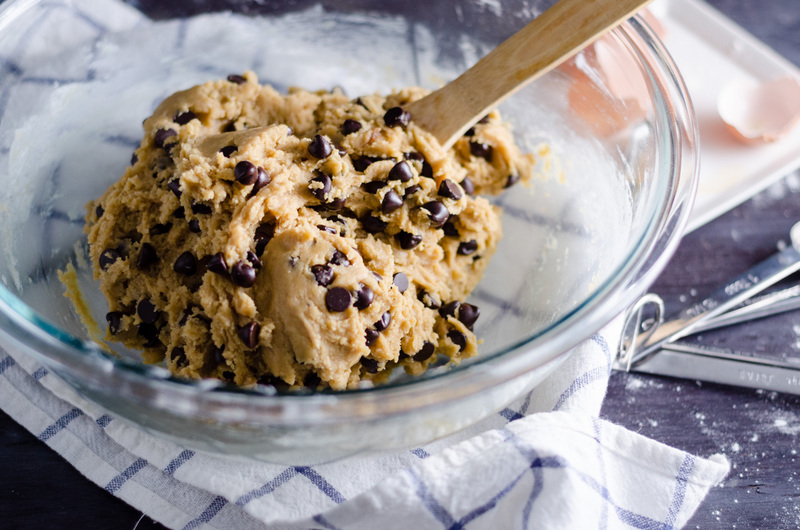 You did it…I will now use this recipe as my “go to” chocolate chip cookie in the future. Thank you for posting it! Oh, I am so so happy you enjoyed them!! It’s not easy to change a chocolate chip cookie tradition…I’m flattered this recipe converted you. Thanks so much for reporting back! Great recipe! I only had white chocolate chips so I added 3/4 cups of cocoa powder to the flour mixture. The cookies turned out great and stayed soft and fresh for days. This is definitely a keeper! Thanks for posting! Made everyone happy, family said they were keepers! Just wondering if using melted butter alleviates the flattening of cookies that typically happens when you use only butter in a recipe? I love using butter in cookies because they taste so much better than just using shortening. However, they tend to flatten out. I would love to try this recipe if I knew that they would retain some height. Thanks! Flat cookies can be caused by a lot of different factors, but these cookies do retain their hight even after cooling. If you’ve had trouble with proper creaming in other all-butter cookie recipes, the melted butter in these will eliminate all of the guess work. Is there a reason to rolling out pieces of dough like that? Or can you normally roll them out into dough balls and bake them? Hi! I think that they spread out more evenly, and the tops of the cookies look nicer using that method. Hmmm…they certainly shouldn’t be cakey. Perhaps too much baking soda, or extra large eggs could be the culprit? Thanks! If you’re looking for another cookie recipe, I highly recommend the Browned Butter Brown Sugar Cookies…I make them all the time too!! I made these tonight! They came out perfect, thank you so much for yummy and quick cookies! I left the cookies halved after the split step, and I just made twice as many cookies. Excellent, quick and simple recipe. he informed me this morning that he really does not care for mine, REALLY? so I went hunting for a substitute. MAHALO, Thank you so very much! Oh no! Haha! Glad you guys enjoyed these! I loved this recipe. Do you think it would work if I spread the dough out onto a 9x13in pan and baked them? So I could have choc chip bars? Awesome!! Yes, I think it would work out well. I’d butter or parchment line your pan and probably up the baking time to about 25 minutes. If you try it let me know how it works out; I’d love to know!! Made these with my 9-year-old daughter using bread flour and dark choc chips and they were so chewy and delicious! Our new go-to cookie recipe. My brother called to ask if my mother had made chocolate chip cookies, which she hasn’t done in a long time, so the obvious answer was…..No! So, I began to rummage through the never ending internet in search of a chocolate chip cookie recipe that was different; I came across this recipe and decided to experiment with it before even adding the chocolate chips. I’m happy to let everyone know that this is one AWESOME cookie recipe even as a sugar cookie, the chocolate chips only added to its depth of deliciousness. I think I’ll experiment with Stevia, for myself, since it’s closer to behaving like real sugar. I just had to thank you for this recipe. My brother’s GF can’t say anything as we were told………she ate them all in one night! I will definitely be using this recipe again and again. 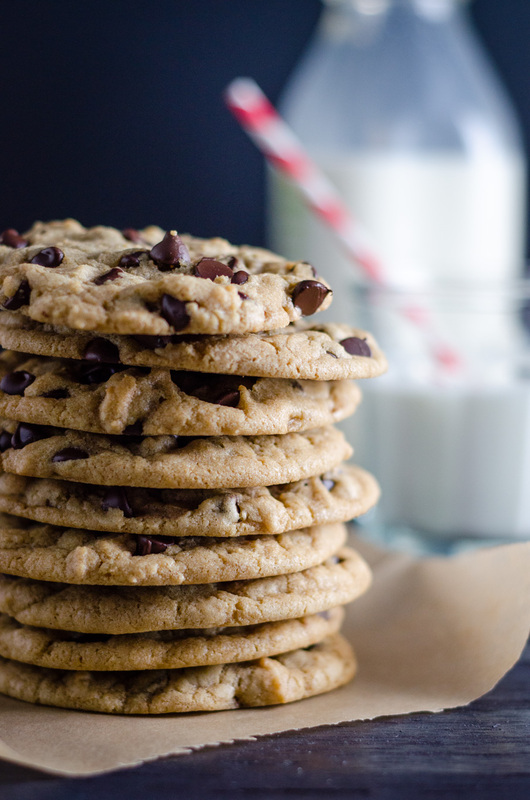 Talk about a big, chewy cookie…this is it! Hmmm…sorry they didn’t work out for you…could be a lot of things. Maybe too much flour, or the eggs were too large?? I baked at 325 and took forever to get done. The cookies never did brown and were hard? Any ideas as to what happened with mine? Sounds like your oven may not have been warm enough if the cookies took much longer than 15-18 minutes. Also, perhaps your dough was too dry? Too much, flour, old brown sugar, small eggs? Or maybe they were over mixed? Hope this helps!! The original recipe is from Cook’s Illustrated, which is extremely reliable, and they spend an extensive time testing. Sorry these weren’t successful for you. You didn’t do them properly. I have made these cookies several times, and they are the BEST! i get 16 ounces of Real Vanilla at Costco for under &7.00. It is a HUGE bottle. for you bakers this is a boon if you are near one or can shop with a friend who has a card!. I’ve made this recipe so many times and attention to detail is crucial. These cookies are incredible, but baking isn’t for everyone. Making these at my boyfriend’s house so I had to use Imperial (butter? margarine?mostly vegetable oil) and augment the almost-enough-flour with quick oats. They turned out beautifully anyhow. Brown on the bottom, crispy on the outside, chewy in the middle, and had a nice gloss to them that I’ve never seen on a chocolate chip cookie before. Yummiest chocolate chip recipe I have tried! I will definitely use this again! I baked a small batch of these tonight and ate one while it was still warm. It was delicious! I used Ghiradelli bittersweet chips (1 1/2 c). I refrigerated the remainder of the dough for baking another batch tomorrow. I sealed the remaining baked cookies in an airtight container. I checked on the baked batch after an hour and they seemed very hard on top. Is that normal? I made the NYT recipe last week and the next day they were like friisbees, again hard on top even though they were perfect while they were warm. My friends for whom I made them, (the NYT recipe) said they were fine. Am I being too hard on myself? I bake often and followed the recipe to a T. I feel like I’m still looking for the perfect CCC. I like Ms. Fields cookies that have the right consistency for my taste. Not hard on top after an hour. Should the cookies be hard on top the next day? It all depends on your chocolate chip cookie preference! 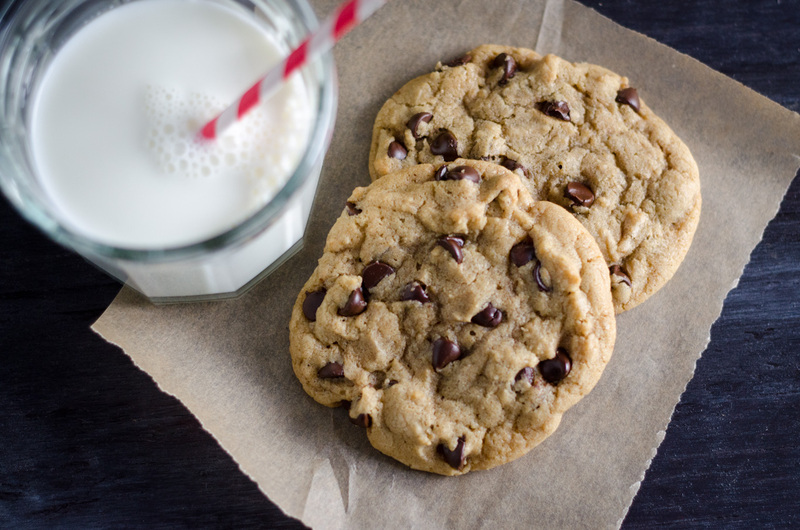 Crisp, chewy, soft – everyone has their own idea of chocolate chip cookie perfection. It sounds like you prefer soft. These will get harder as they cool, but should stay chewy. I haven’t had Mrs.Fields, but it sounds like they are a softer style cookie. A quick look at the calorie/ingredient statement on “her” website, shows shortening, oil and cornstarch; all of which will produce a cookie that stays soft. I would try a recipe with cornstarch if you want a cookie that will stay softer longer. This helped a great deal. Thanks. I look forward to reading your future entries. I love the cookies. They r amazing !!! Mmmmmmmmm yummy! My mum and I just finished making these 4 school since I am 10 years old! We’ve been looking 4 the best recipe and we have found it right here! The cookies taste so AWESOME! It worked out perfectly! My boys are thanking you ! I’m a horrible baker but this recipe turned out perfect !! Definitely will be using again! Oh gosh, instead of 1.5 stick of butter I used 1.5 cup. I guess just love being creative. I didn’t want to double the rec bc I had never made it before and we figure I need to add 60% more, so I just add “some” using my kitchen ingenuity. In the end I added enough flour to get the right consistency. I rolled up some cookies for the kids, and with the rest of the batch I added oatmeal, raisins, cranberries and macadamia nut and baked it in a square pan. I figure it could be my breakfast bar. The kids loved the cookies, and I loved my bar. Thanks for the great tip of how to roll out the cookies so they don’t have a flat face. I could never figure that out and most people keep their recipe secrets to themselves. Thanks for sharing. No more flat faced cookies for us. Oh geeze! Glad it still worked out!!! If you happen to make the same mistake again (not likely, I know! ), you could have doubled it. 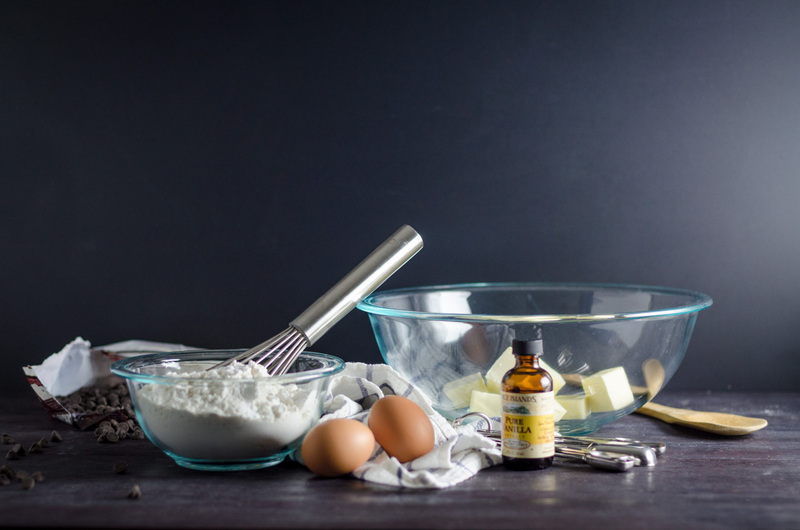 There are 24 tablespoons in 1.5 cups, which should be exactly double the butter in the cookies. So glad you enjoyed them! Hi! quick question, I am supposed to make cookies for one of my classes, and I want to know what they will look like by tomorrow. If I were to put these cookies in the fridge if they would harden? what if I left them in an airtight container on the counter? please let me know! Hi Caroline! I would say an airtight container at room temp would be best. I make cookies the night before and bring them into work the following day all the time and they still taste great. Amazing recipe! My favorite chocolate chip cookie recipe by far. I had to adjust the baking time according to my oven, but amazing cookie! I feel like a REAL baker!!! Niiice! Glad you liked them!! This recipe is great! I tried it with my friend and so far I’ve made dozens in a month. It tastes delicious and soft and is really easy to make. 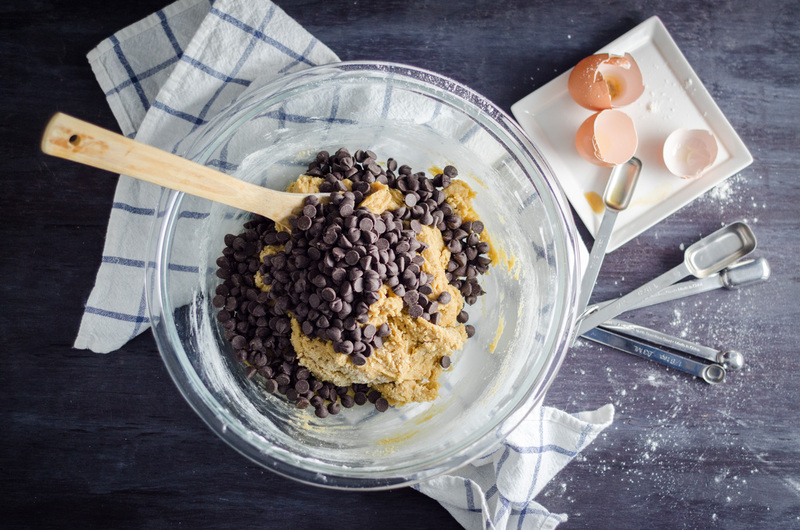 I stumbled across this recipe while looking for a chocolate chip cookie recipe using melted butter, as I was baking with children and wanted to simplify the process a bit. I was so so happy with the results – these have become my new go-to chocolate chip cookie recipe! Thanks so much for posting your adaptations… and the scrumptious photos! Seriously these are the best chocolate chip cookies I have ever made.I usually always adjust a recipe to be even healthier, and the first time I made these I made them as is, and they were great! The second time I made them, twice in a weekend, I used a half cup of coconut oil and 1/4 cup of butter, and 1 cup of dried cherries and 1/2 a cup of chocolate chips. I like a little extra salt in my sweets, so after rolling and splitting the ball (GENIUS!!) I sprinkled a tiny bit of extra sea salt on the newly formed balls. AWESOME, so simple and yet seriously the best. Awesome! So glad you liked them!! I’ve been looking for a good chocolate chip cookie recipe — one that is truly soft, chewy, and thick — and came across this one so I tried it. SUCH a good recipe! I’ve tried many others that claimed to produce “chewy” cookies but they have all failed. This one was really perfect! This is definitely my “go-to” recipe now. Thanks so much!! I have these bookmarked in my Favorites bar and refer to them often when I need a foolproof, yummy, chocolate chip cookie. I don’t see where I’ve ever commented on them so I just wanted to chime in with my praise. Today, I put in a cup of semi-sweet chips and a half cup of mini butterscotch chips – oh my. Baking them for some visiting relatives and thought the kids would enjoy them. Thanks so much for this very reliable recipe. disregard my comments above i am baking them and they are really good!! definitely bakery-like ! thanks. Only cookies I make now! Love this recipe and I’ve passed it on to others! My computer crashed and I lost all my “favorite” recipes, googled chococlate chip cookies and found this one. What great cookies and so easy to put together. I baked them for a friend, but I’ve been sneaking a few for myself. Putting this one in my new favorites list. Thanks! It is discusting! I made them and it went like a stodgy lumpy flat cake, this was awfull and tasted vile! to ellie louise: you did something wrong. these cookies come out delicious every time. I’m on this page bc I’m getting ready to make them now at 857 PM. Sorry you and a bad experience. Hi Heather! One of my favorite ‘cooking books’ is COOK’S ILLUSTRATED. I think I’ve been getting it since their first issue…many many years ago. The chocolate chip cookie recipe I used for a gazilion years people loved. Then COOK’S had their best CCC recipe highlighted one month, a few years ago… I tried it and never looked back! One thing I do a little differently from your recipe, which essentially the same as COOK’S, is that I allow the sugar to blend/dissolve – I wait maybe 10-12 minutes before I add the dry ingredients. I find that they are nicely crisp on the outside and very chewy on the inside. Thanks again for a lovely blog! Hope you guys are staying warm and safe! Mona! I’m obsessed with Cooks – they’re so awesome. I actually do the same thing you do – I let the sugar rest with the butter for about 10 minutes (if I’m not impatient)! We’re staying warm although Aida needs her doggie boots 🙂 Hope you’re staying warm as well! The batter for this cookie almost didn’t make it out of the mixer and onto the cookie sheet. Wow is it good! My variation: I added unsweetened cocoa powder (along with chic chips) for my chocoholic hubby. I would never have thought to add cocoa powder! How much did you add? I don’t have a convection oven, so I’m not certain either. Has anyone else tried baking these in a convection oven? What worked best?